Evil has visited Somaliland on 28 November, 2012, and that the devil has been on the works in the name of the National Election Commission (NEC) and a corrupt judiciary, both bodies remain an integral part and an extension of the failed and detested ruling party. Blood has been shed with the recent senseless and unspeakable tragedy of massacring innocent youth, by simply showing their dissatisfaction with the election results by demonstrating peacefully, will not go unanswered and proper justice will be done without spilling any further bloodshed. It is morally unacceptable that there is no investigation, no remorse, and no condolences, and of all no showing any regret whatsoever. We grieve for the families of those slain children and we condemn at the strongest terms this horrific and heinous crime against innocent citizens. These children are our children and they will not be forgotten. There is a ticking time bomb in Somaliland and the whole country is heavy with severely wounded. However, we categorically reject this dictatorial and capricious policies directed by a small group of unconcerned and morally wicked cockups. They are doomed to fail and only time will tell. Your days are numbered and Somaliland will prevail. We refuse to believe that the bank of justice is bankrupt. Now is the time to rise from the dark and desolate valley of corruption to the sunlit path of democracy, social development and the right application of the rule of law. Paraphrasing Martin Luther King’s words – now is the time to lift our nation from the quicksand of injustice to the solid rock of fraternity and brotherhood. Now is the time to make justice a reality for the entire nation. It is unbelievable to comprehend what has transpired from the so-called municipal elections. The National Election Commission (NEC) operating under the strict instructions from the Presidency has engaged a daylight fraud by implying the most thoughtless techniques of corruption including burning ballot papers, stuffing ballot boxes, deleting data from the main server, clandestinely distributing ballot papers to certain political parties prior to the election and at times burning proper ballot papers. This shameful operation simply constituted a daylight robbery carried out by amateurs with no meaningful ethics or values. What they have done is wholly satanic and contradicts all our religious teachings. But rightly this is the wickedest blunders ever recorded in the contemporary history of democratic societies. Mr. President, unfortunately your legacy is truly marred by this unbelievable act of political bungle. 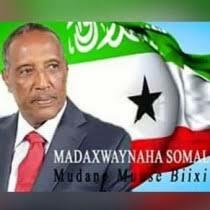 You have miscalculated the power of the people and surely your biography will be written in the dark pages of Somaliland and as someone who betrayed those that have given you their full confidence. Our destiny is clear. We expected ensured respect for the law, and equal treatment under the law, for the weak and the powerful, for the rich and the poor, and that our people again are proud of their government once again. The struggle for independence has been long, painful and nurtured with blood. It is unwavering and we will defend it with solid resolve despite your wrongful miscalculations and misguided innuendos.